In 1880 the King of Siam gave two pairs of Siamese cats to the English consul-general in Bangkok, and he brought them home to England, where they created a sensation. Their popularity zoomed rapidly. Although the breed standard has changed significantly over the years, Siamese remain high in popularity for people looking for a pedigreed pet. Whether your tastes run from the traditional to the modern version of the Siamese, these pictures represent exotic looking "Meezers" in all their glory. Also learn about some of the individual behavior and quirks of the cats featured. Ruby is a blue point Siamese cat, age 9 months in the photo. She is a very crazy cat that hates to be teased about her crooked tail. Her favorite time of year is Christmas because she loves to hide under the tree skirt. This is Baloo, he is a 5-year-old Siamese seen here with his brother Baby. Baloo is a dedicated kitty and loves to play with his toys (hair ties) which he conveniently leaves in the food dish every morning, as if it was his prey. Sir Lancelot of Blue-Gem is a classic seal point Siamese. He is extremely smart and affectionate—a real Casanova. He loves to greet everyone at the front door. The moment the door bell chimes he's off sounding the alarm with the typical Siamese vocals. Once you are allowed in you are greeted then he decides how worthy one is of his presence. Toasty is a 1-year-old chocolate point Siamese that loves to lounge in the sunlight. He's a playful, sweet, and very smart boy. He has "ragdoll" qualities in that he will never squirm when picked up and is always up for a good cuddle. MoJo is a chocolate Siamese and is about 3 years old. He is very talkative and playful and likes to pounce the other cats when they least expect it. He loves to be on top of the cabinets and is the boss of the cat family at the house. Jeter loves his belly rubbed; all you have to do is ask if he wants a belly rub and he rolls over. He loves to talk, and his favorite place to be is in his owner's lap. Jada is polydactyl, with extra toes on all four feet. When he sits on his owner's lap he likes to "hold hands," which with the extra toes makes if feel like a furry little hand. He was adopted him from a Siamese rescue group, is somewhere over 12 yrs of age. He has asthma, beginning chronic renal failure, and an enlarged heart, but none of that stops him from playing like a kitten at times. This is Violet who is a 1.5-year-old lilac Siamese-tabby mix, adopted from an organization that rescued her and her family from an overcrowded shelter. Nicky is a chocolate point Siamese. He is full of mischief and wIll steal anything that looks like "fun". He loves ponytail holders and will play with them for hours. Mickey adopted his owner, Leonie, when she went to a local animal shelter to make a donation in memory of a friend's cat. Mickey jumped down from a shelf, came right up to the wire where her hands were resting, and gently placed a paw on her hand. While she had no plans to adopt a cat that day, Mickey was soon in his new forever home curled up in her lap. His markings and coloring suggests he may be a snowshoe. Mickey has an affectionate personality, being a real snuggler. He supervises the hosehold to ensure the human gets things right, especially feed times. The crazy-eyed space cat' comes out sometimes, as does the wild jungle tiger. Mickey is no wallfloletting thewer or scaredy-cat and is totally trusting of everyone; he is very welcoming of visitors. As an indoor cat, Mickey's favorite spots include his cat tree, anywhere in the front room which gets full sun, and on the bathroom floor in the mornings when the underfloor heating is on. Levi (named after the denim color of his eyes) is a purebred who has a long line of champions and supreme champions. He loves being brushed. If he sees a brush, he runs towards it. When he is being brushed nothing matters or worries him. Jupiter: Blue Point Traditional Siamese. This is Jupiter, a 4-year-old blue point traditional Siamese. He loves constant attention (he has the characteristic cry of a Siamese) and likes to sit in the middle of anything his owner is doing. He loves to play catch with his jingle ball, he loves chasing things, and most of all he loves to cuddle up on his owner. Mousse (as in chocolate) didn't get along well in his first home, being jealous of the other cats. His owner made sure a good forever home was found where he would get lots of individual attention. He is now a very good boy. Pepper and Poppy are 3-year-old lynx point Siamese and Bitsy is a 2-year-old seal point munchkin that the big girls adopted. Pepper is the mommy figure for her but Poppy really prefers to just play "tag, you're it." Even though they are indoor girls, all three walk on a leash. Travel in a small RV allows them to view the world as they go by. They love going to the park, watching squirrels play, chirping at the birds. Buddy is a 10-year-old Siamese tomcat that shares our country home with his owners. He pretty much has the run of the acreage and being a tomcat loves to bring the odd critter home. One day upon returning home the owners found a large and deceased "ruffed grouse" in their living room and Buddy sitting there proud as a peacock. It must have been a tight squeeze through his small pet door. Chance is a 10 -year-old male. Chance has stayed light in color, still white in many areas of his body. He is a very proud boy and would rather sit around and preen himself and soak in the sun, and cannot stand to have his hair ruffled. If it is he immediately has to clean himself. Chance's big compulsion is to eat brooms and they must be kept out of reach. Sophie rapidly turned dark her first year. She is a lover, but will not allow her owner to pet her until she wants to be petted. Sophie also loves to play fetch, and she is every bit as good at it as any dog. She brings her toy right to her owner, drops it, and waits for her to throw, again and again. Her favorite item are ponytail bands. She would rather have rubber bands, but she wants to eat them. She can smell them out of any hiding place so its been a challenge to keep her out of them. Shadow is one of two Siamese in a household. 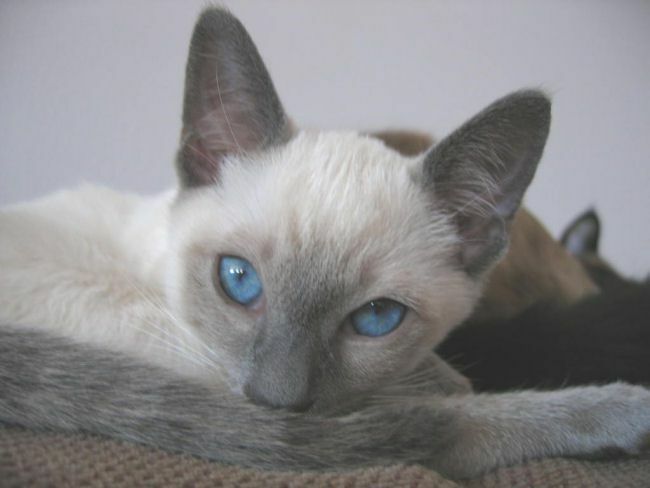 Skyy is one of two Siamese cats in a household and is also called Baby Girl. Luiza is a Siamese cat less than 4 months old. She's sweet and full of energy, having a lot of fun playing in an apartment in São Paulo, Brazil. Sparkle was adopted from Siamese Cat Rescue Center when she was 12 weeks old. Timmy was 6 years old in the picture. He is a Lynx Siamese cat and his owner says he is one of the most spoiled cats in the world, but well worth all of the trouble. Bailey is a 5-year-old Siamese. He likes to chat very often and very loudly. He was rescued from an abandoned apartment and has grown from a shy frightened kitten to an outgoing, confident, cool cat. Bailey's favorite past time is cuddling in his owner's lap, purring, and doing "the happy dance" with his paws. These are two Siamese brothers about 7 months old. The one on the left is a chocolate point and his name is Chat. The one on the right is a lilac point and his name is Chan. They were adopted from a breeder who has been breeding cats for over 45 years. Tostón is a 9-month-old male traditional Siamese. His curiosity makes him a little "suicidal" sometimes and has been caught with his body half out of a window. He hunts what insects might be found indoors and loves to chase little balls of tin foil. He looks like a soccer player dribbling his way to a goal score.